Cuisinart: always willing to modify a successful concept in hopes of winning a new audience. This Brew Central coffeemaker takes the design cue from the popular Grind and Brew line but without the coffee grinding feature. What has been retained is the solid stainless steel build, with a new dark finish they are calling Black Chrome. Is it the new black? Or the new stainless steel? Time will tell. Anyway, this is an attractive machine, and the extra tall 12 cup glass carafe sits securely in the base. This uses the #4 filter and includes a Gold Tone permanent filter in the box. Also included is a charcoal water filter and measuring scoop. With a digital display, you can program the brewing up to 24 hours in advance, and additionally, you can adjust the warming base to the temperature you like, as well as how long it keeps the coffee warm before shutting off. All these features are controlled by the rather novel rotary dials, and a toggle switch on the front. That's right- a toggle switch. While other makers are updating their machines with fancy touchpad controls, here's Cuisinart shopping at Radio Shack for design inspiration. You must give them points for "keeping it real". Some additional touches that show they care include a water level gauge to show how many cups are in the reservoir, and an audible signal that sounds off when the unit has finished the brew cycle. 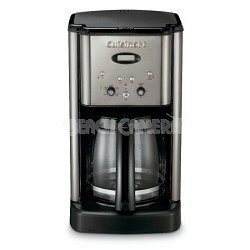 With the overall positive user feedback, Cuisinart has what looks to be another winner in the coffeemaker arena. Here's another 12-cup Cuisinart coffeemaker to consider: the Brew & Serve.